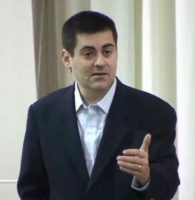 (Pulpit & Pen News) That’s the response that is due the recent SBC Echoes post defending the former Democratic Staffer, animal rights activist, Martin Luther King celebrator, Cultural Marxist, illegal immigrant amnesty-supporter and George Soros partner, Russell Moore. In polemics there’s a term called “website orthodox,” and it’s a term with which anyone capable of entry-level discernment should be familiar. Website orthodox refers to someone who has an orthodox statement of faith hyperlinked on their website, to which they can point and deflect from their criticism. For example, IHOP has a perfectly orthodox statement of faith on their website, but in reality, they’re a circus cult and freakshow sub-Christian sect.